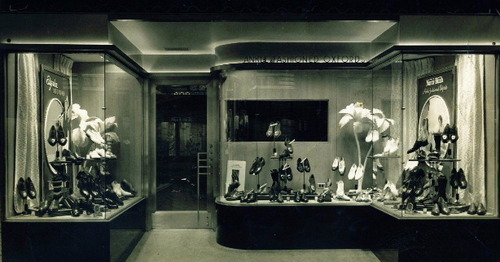 Originally established by Mr. Clyde Vanbeckum in 1939, Vans Men's Shoe Shop opened for business in the now Historic Downtown Milwaukee Phister Hotel. Clyde ran his shoe business until the spring of 1952 when he entered into an agreement to be aquired by Floyd Reese, a veteran of the Nunn Bush Shoe Company. 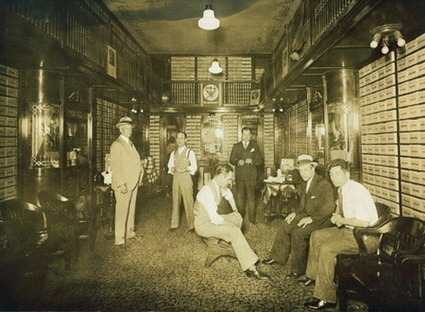 Floyd Reese pictured here ( standing rear right ) in the shoe store he managed for the Nunn Bush Shoe Company. Floyd spent 25 years with the Nunn Bush Shoe Company holding various positions until he retired. Shortly after retirement Floyd heard that Clyde was looking to sell his shoe business and the rest is history. Still tightly held by a third generation family member. Van's and now the MenShoeNet internet shoe website, continues to flurish offering a wide variety of quality brands, styles and premium customer service.